SNAG® has introduced its “Exceptional” line of equipment designed for players with physical challenges holding traditional or original SNAG® Golf equipment. The equipment matches specialized grips and gloves made with hook and loop material. This combination makes it very easy to securely hold the club without fear of it flying out of the player’s hands. Utilizing the SNAG® Coaching System’s patented word cues “Left on Yellow, Connect, Right on Red” teaching the proper hold has never been easier, or more effective. Now we have simply moved the colors from the grips to the gloves. The “Exceptional SNAG®” equipment is available in the 30” and 34” club sizes and orientations. 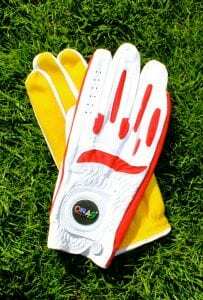 The gloves come in pairs ranging from size small through extra-large. The same SNAG® programming applies with the SNAG® Exceptional Equipment line in terms of how to play and how to teach. Exceptional SNAG® Equipment is recommended for any persons aged 10 years to adult who experience difficulty holding or swinging the club. When using Exceptional SNAG® with populations experiencing disabilities, it is important to assess the type of equipment to be utilized based upon the specific needs of each individual. 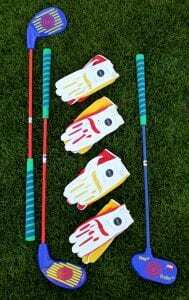 The club and gloves are sold as a set.